Sitejam Recenze 2019 - Proč 4.3 hvězdiček? If you are looking for a site builder that will give you just the barebones minimum, then Sitejam’s sparse features will get the job done. The availability of a basic eCommerce function, blogging tool, and SEO options is commendable, but there is a limit to how much these features can deliver. Sitejam does not offer any bells and whistles but it gets the job done for the most part. Right from the beginning, one gets the sense that Sitejam is the type of site builder that offers only the bare minimum. In many ways, this first impression is accurate. Sitejam aptly states that it is ‘built for busy people’ who do not want to be slowed down by technical stuff. Setting up your website is indeed as simple as selecting a design, adding content, and going live. While Sitejam does take the hassle out of building a website, there is a stark absence of powerful features. What you get instead are the basics: simple SEO tools, a no-frills eCommerce function, and a simple blogging tool. To be clear, while these features get the job done, don’t expect your website to perform any sophisticated functions. A nice thing going for this site builder is the attractive, modern, and fully responsive templates, which will certainly add spark to your website. 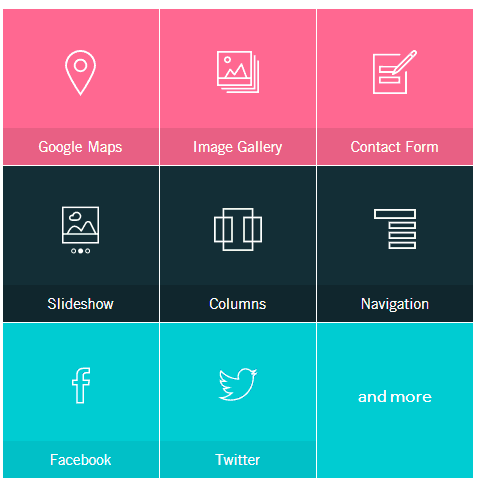 Seamless integration with social media, Google maps, contact forms, galleries, and slideshows is a plus. While Sitejam’s drag and drop interface is cleverly designed, this builder still has a long way to go in terms of intuitiveness and modern features. 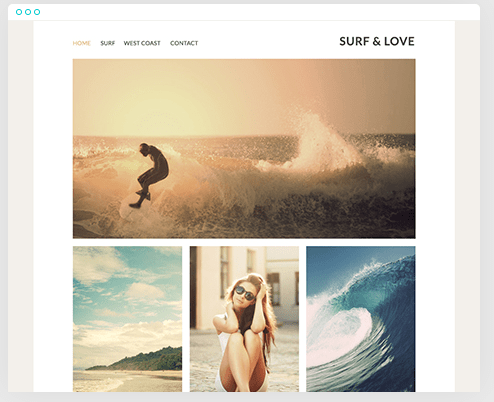 Build a Modern, Responsive Site using Fresh Templates. Beautiful templates: Whether you are looking to build a blog, a personal website, or a business website, you will find a suitable template here. Many of Sitejam’s templates are well-thought out and will certainly give your website a unique look. Responsive: All themes here are mobile-first—site visitors can switch between desktop, tablet, and mobile view—and engage with your site seamlessly across all these devices. Customization: Sitejam is largely a drag and drop builder letting you make simple customizations to your site such as changing the color and font. Those with coding knowledge will appreciate the HTML and CSS access which lets you customize the site’s code for a whole new look. eCommerce: Thanks to this site builder’s drag and drop functionality, you can build your web store and start selling in a matter of minutes. No third-party integration is required, which is certainly a big plus in terms of convenience. The eCommerce function is available across all three plans so whether you have just a few products or a large number of them, Sitejam web stores make selling completely hassle free. SEO: There is hardly any mention of SEO on Sitejam’s website, but upon implementing the theme, it became clear that the available SEO tools are very basic compared to what other site builders offer. Generally, the only SEO information you can input here are site description and keywords. With Sitejam’s high price mark-ups, one would expect more impressive marketing tools and comprehensive site analytics. Blog: The availability of a blogging tool is commendable, but don’t assume it comes with advanced blogging options. Sitejam’s basic blogging tool lets you easily create and publish posts with just two clicks, and without the hassle of setting up and managing a blog , you can focus entirely on content creation. Like many modern site builders, Sitejam comes with a drag and drop functionality that truly takes the fuss out of setting up a professional website. Want to build a page? Just move elements around easily and drop them where you want them. Each template comes with dummy content, which is helpful in showing you where to input certain elements, so you can build up a functional website in just a few minutes. The templates offered by Sitejam are not only beautiful; they are also very versatile and flexible to work with. These templates give you a solid canvas to build your site so there is plenty of space for creativity. The menus are clearly labelled, which further simplifies the interface. This allows you to easily see the available elements, which you can seamlessly move across the interface to build your desired website. If you happen to need emergency assistance with the Sitejam site builder, you will be disappointed. There is neither phone support nor a live chat option. The only way to get in touch with tech support is through an email ticket submitted through the Sitejam website. The support team is only available between 9am and 6pm GMT. 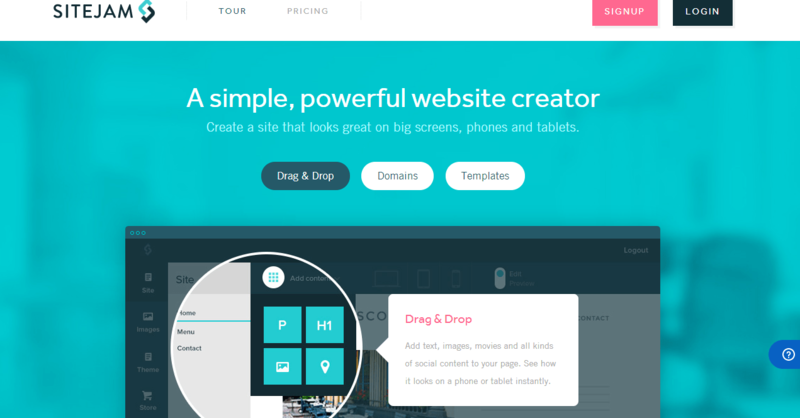 Pocket-friendly Prices for a Modern Business Website. Sitejam offers you the choice of a Basic, Business, or Enterprise plan, depending on your needs. The Basic plan comes with 10 pages, 25 MB storage, access to one free stock image, and capacity to sell up to five products. Upgrading to the Business plan offers you more features including unlimited pages, unlimited storage, three free stock images, and the ability to sell up to 10 products here. The Enterprise plan gets you unlimited pages, unlimited storage, a menu editor, a free domain name, free email address, 10 free stock images, and the capacity to sell an unlimited number of products. This plan is obviously ideal if you are looking to expand your business, sell more products, and enhance your brand. You can try some but not all the features on the free 14-day trial, which does not require you to provide any billing information. Sitejam positions itself on the higher-end of the market, so the prices may be relatively higher than what other site builders offer. Although Sitejam has tried to position itself on the higher end of the market, it does not stack up well against other more powerful site builders on that market segment. If you are looking for a site builder that will give you just the barebones minimum, then Sitejam’s sparse features will get the job done. The availability of a basic eCommerce function, blogging tool, and SEO options is commendable, but there is a limit to how much these features can deliver. For the same price offered by Sitejam, you can get yourself a more robust site builder that offers stronger features and is more intuitive. Přemýšlíte, jak si Sitejam vede v porovnání s dalšími nástroji? Zadejte jakýkoliv jiný nástroj pro tvorbu webů a my vám je mezi sebou porovnáme.